At least that’s how I remember the best busted headline that didn’t get published in my 23 years of newspapering. It was at the Ottumwa Courier in the early 1990s, when Erich Honecker, a Communist leader from the former East Germany, died of liver cancer in Chile, where he lived the last years of his life in exile. 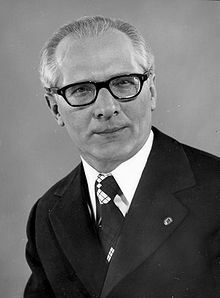 Because of alert and experienced workers in the newspaper’s back shop, Courier readers were not mistakenly led to believe that Honecker was toppled in a bowl of the stew-like dish made of peppers, tomatoes and beef. Those wily newspaper veterans caught the mistake, which was on a front page that was within minutes of being sent on deadline to the plate room and then to the press. I’m not sure how often the same thing would happen today if someone made that mistake again. But that does not mean the people working today are less conscientious or talented than their predecessors. In fact, because of the multiple hats today’s reporters and editors wear, they may be more talented than the ink-stained wretches of past generations, who, it’s worth pointing out, also made mistakes. And because mistakes have always been made, it’s easy to chalk it up as a human error when Gov. 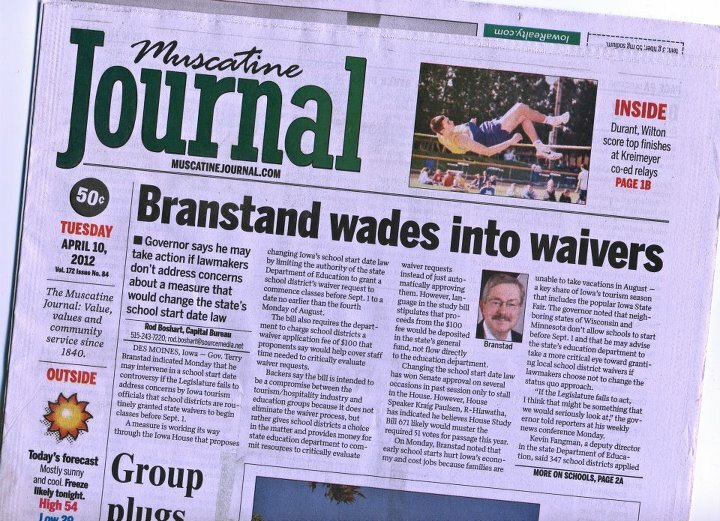 Terry Branstad’s last name was misspelled in a banner headline on the front page of Tuesday’s Muscatine Journal. Fair enough. After all, humans put together newspapers and humans make mistakes. Therefore, there always will be mistakes in newspapers. But the real problem is that fewer and fewer people are doing the work today as newspaper revenues have continued to drop. Many newspaper companies have responded by cutting expenses and laying off people. This has very little to do with me. Or the fact that I lost my job at the Journal in February due to budget cuts demanded by Lee Enterprises, the newspaper’s parent company. If you want to know the truth, proofreading was not something I enjoyed. But if you go back in time, to when the Ottumwa Courier nearly toppled a dictator in a vat of soup, more than 20 people worked in the newsroom at the Journal. Today, there are nine full-time employees there. And at least two of them have many duties not directly related to putting out a newspaper every day. 1. Added a production day. When the Journal published an afternoon paper on weekdays and a morning edition on Saturdays, six newspapers were produced in five days. Now it takes six days to produce six newspapers, which spreads even thinner an already thin staff. 2. Means pages are finished late at night, when perhaps as few as two or three people are working. As an afternoon newspaper, nearly everyone who worked in the newsroom was there to help proof pages as they were being finished. Making do with as few employees as possible and converting the Journal to morning publication were — and are — good business decisions. Switching to mornings saves the Journal and Lee Enterprises thousands of dollars annually because it enables Lee to print the Journal and the Quad-City Times in Davenport with one crew. Both newspapers are also delivered in Muscatine with one crew, which adds to the savings. That is important for Lee, which has been burdened with about $1 billion in debt from its 2005 purchase of the Pulitzer newspapers, including the St. Louis Post-Dispatch. What is more open for debate is what, if anything, these changes have meant for newspaper readers in Muscatine and other communities where similar cuts have been made at newspapers owned by Lee. And what these changes mean to readers may not be what carries the most weight when decisions are made. Make no mistake, every single person at the Muscatine Journal takes very seriously the newspaper’s mission to serve its readers and advertisers. But those goals may not always jibe with demands created by Lee’s financial situation. And that itch will always get scratched first. Chris, this is the nature of the business. Newspapers are ontologically tied to paper. That means they have to get printed, delivered and read by one person at a time. Lots of places for costs to add up. On the other hand, your blog tells me more information about Muscatine, IA than I know about my own hometown in Michigan. You do that with one person with a lot of time on his hands and a digital camera I know cost less than some of the bar tabs we used to run up. I can read it anytime I want and at no cost. I’ll say it….newsPAPERS are dead on the vine and there is no amount of restructuring that will save them. They are the telegraph in the age of the wireless. They are slow, lumbering dinosaurs with small brains. That said, NEWS is not dead. We still need information. We still need people to gather it, edit it, check it. We just don’t need them to print it. You are a NEWSman, not a newsPAPERman. Lose the chains, brother. That was a nice edit, BTW, Bill. Check out the new slogan at the top of this site. Everyone needs an editor.